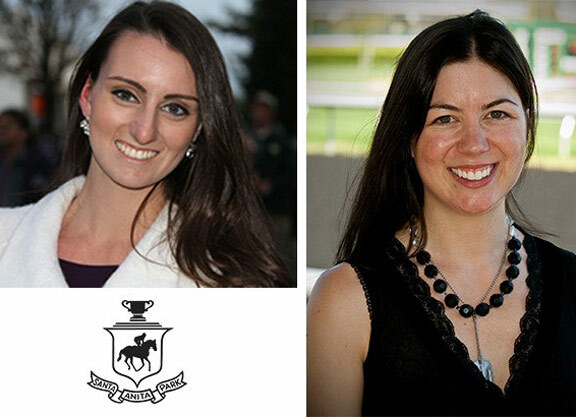 Angela Hermann and Megan Devine will work as a broadcast team analyzing races and interviewing horsemen trackside and from the paddock throughout Santa Anita’s upcoming fall meet, which opens Friday, Sept. 30, the track announced Thursday. They will be streamed live at santaanita.com and at calracing.com and will be readily available to groups and individual players in an effort to reach out to a new generation of fans. Hermann was a longtime paddock analyst at Canterbury Park and just finished a stint as track announcer and racing analyst at Golden Gate Fields this past Sunday. Devine attended the University of Louisville and began working as a production assistant for NBC leading into the 2012 GI Kentucky Derby. She has since traveled with the network, working on Triple Crown and Breeders’ Cup shows in various capacities, including Assistant Field Producer and Stage Manager. Devine also served as the on air racing analyst at Ellis Park.